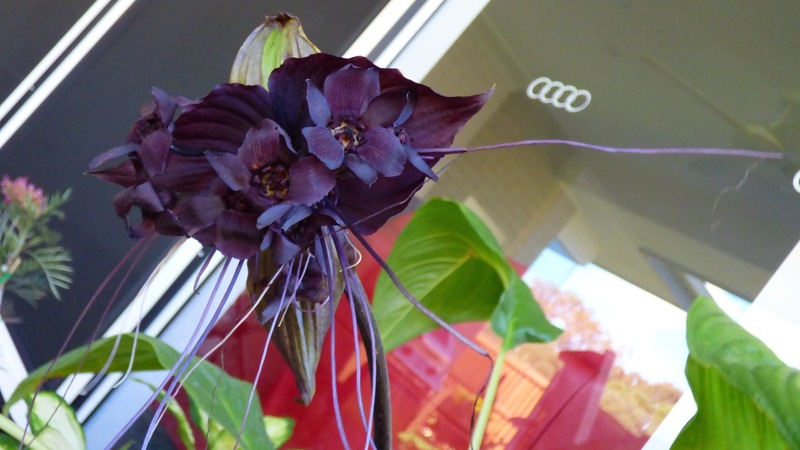 Scientifically known as Taccachantrieri, the Black Bat Flower is a stunning flowering plant also known as Devil Flower, Bat Head Lily, Bat Plant, Devil’s Tongue, Black Tacca, Jews Beard, Voodoo Flower, and Cat’s Whiskers. The main attraction of this plant is, as its name suggests, the flower, the umbel – a flat-topped inflorescence with numerous flower stalks. Describing the flower is difficult, I’ll try, but lay no claim to being accurate – scientifically or otherwise. To put it simply, the flower is stunning. Each umbel has a pair of large spreading, wing-like bracts (leaves that look like petals). These large bracts look like the wings of a bat in flight and hence the name of this unusual plant. They can vary in colour and appear either rich maroon-black, slightly brownish or even a deep purple. There are two smaller bracts, and the flowers and bracts are accompanied by long trailing filaments (bracteole) that appear to extend from the base of the flowers. Typically the stem can be 60 cm tall (24 in) and the flowers can be as wide as 30 cm (12 in) with those copious filaments reaching to an extraordinary length of 71 cm (28 in), longer than the stem is tall. The Black Bat Flower is native to tropical areas of southeastern Asia and they grow very well in the sub-tropical climate of Queensland’s south-east where I live. When Dean gave me this gorgeous plant for my birthday last year, it was a scrawny looking thing with one flower blooming and I struggled to take a decent photo of it. The flower was starting to die, lots of whiskers had already shrivelled and fallen off, and those few leaves it had were pale and scrawny. To be honest, I thought it was so neglected I wouldn’t be able to do anything with it beyond watching it die. 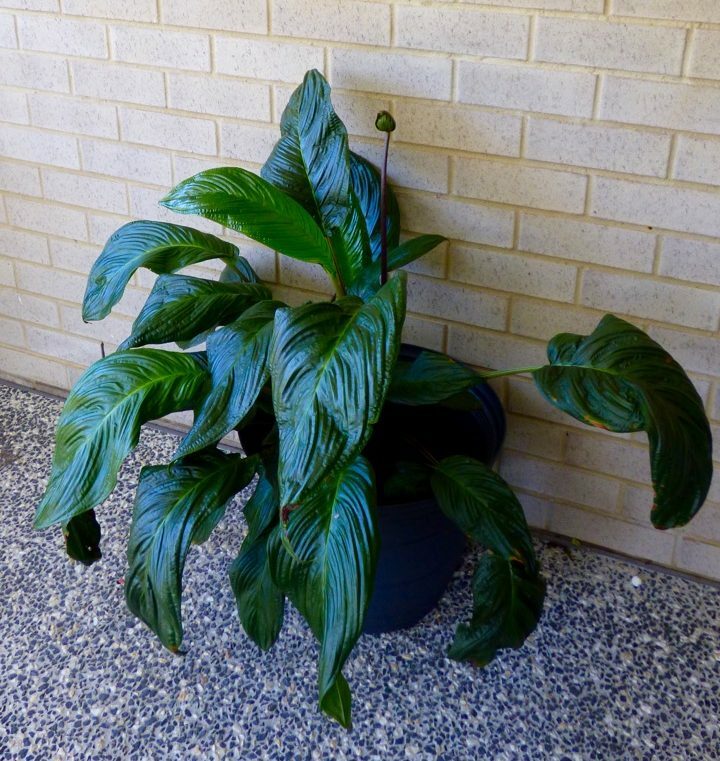 As sad as the plant looked, I loved it and hoped I could bring it back to life. But I’ve never owned one before, so I did what I always do. I sought the advice of an expert. Dr Google led me to several websites that offered a variety of pointers. Essentially, and most importantly, I discovered that Black Bat Flowers thrive in the jungle understory. Immediately I knew it was receiving too much sunlight, copious amounts of direct sunlight in fact. I promptly moved it to a protected and airy position under the roof of our patio where direct sunlight fails to reach. Perhaps during the height of summer, it may have had the odd ray or two touch its leaves, but this would have been in the early morning and only briefly, so I thought that would be ok.
Just look at it now. It’s stunning and about to be even more so. Every time I water it I think it’s bigger than the time before. Not only are the leaves now a beautiful deep glossy green, just imagine my delight to discover umbels. Yes, that unusual ‘alien looking’ stem contains all the genetic material and coding required to produce a breathtaking flower. As if this most extraordinary plant has suddenly woken from a deep slumber, there are four umbels in total, and I do suspect there are more in the process of emerging. I thought I’d be the luckiest of accidental gardeners if I managed to coax this plant to produce just one. Once again I referred to Dr Google and discovered in any one season the plant can produce up to 12 umbels. Wow! I’m in for a treat over the next few months and look forward to sharing photos of the plant as the flowers bloom and progress through this flowering season. Just look at all these umbels waiting to open up and delight everyone with their incredible display. The flowers can last up to seven weeks so this display season may be rather lengthy depending on how many more appear. Perhaps by the time it finishes flowering, the palms in my backyard will have grown tall enough that I’ll have my own little understory where I can plant one or two and see how they thrive there. It was interesting to discover the genus Tacca also includes arrowroot and, according to Wikipedia, there are at least 16 different species. Not only did I discover that the Black Bat Flower, Tacca chantrieri, is the most commonly known bat flower, but there is another species called Tacca integrifolia, the White Bat Flower. It’s a slightly bigger plant and the large white bracts are veined in a beautiful purple colour. I know what I’m ordering for my birthday this year. Thank you Adam. It is rather gorgeous. wow, so unusual bloom. I have never seen it before. Thank you Padmaja. This year’s flowers are just starting to open and I can hardly wait to see them in all their glory. as usual Clare, love your post. I love those plants, sadly even in the under growth of my own jungle I couldn’t keep mine alive. Maybe i’ll try again and in pot next time so I can move it around to find the right place it will thrive. Yes, do that Kylie, it’s well worth the effort. 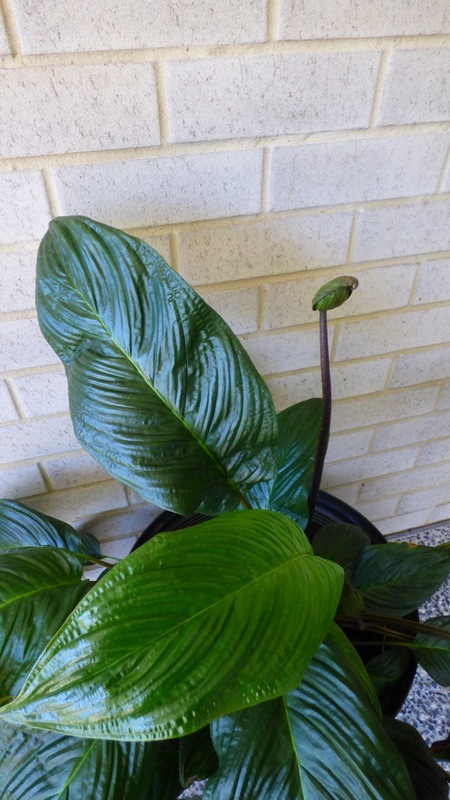 I can’t wait to see the flower when it opens. Thanx Shelley, wait until that flower opens. I’ve no doubt it will be a stunner this year.